WEST LAFAYETTE, Ind. - A team of scientists and engineers, including Purdue University mechanical engineering professor Steven Wereley, released figures Thursday (May 27) showing that at least 12,000-19,000 barrels of oil are flowing daily into the Gulf of Mexico in the aftermath of an April 20 oil rig explosion. That means the BP PLC oil spill off the coast of Louisiana has already surpassed the Exxon Valdez as the worst in U.S. history, according to the U.S. Geological Survey (USGS). Using the most conservative estimate, 450,000 barrels of oil, or 19 million gallons, have leaked into the Gulf since the accident that sank the Deepwater Horizon oil rig five weeks ago, the USGS reports. Under the higher estimate, more than 700,000 barrels of oil, or 29 million gallons, may have spilled to date. The size of the Exxon Valdez spill in March 1989 was 250,000 barrels of oil, or about 11 million gallons. "The intended use of these government figures is to help with the oil cleanup and recovery and the potential methods BP could use to cap the well," said Wereley, an expert in micro- and nanofluidics whose research lab is in Discovery Park's Birck Nanotechnology Center. "We feel these numbers are very reliable because this was a highly qualified panel of scientists and engineers from academics, government agencies and national labs." Earlier estimates by BP and the federal government indicated that 5,000 barrels a day had flowed from the well into the Gulf. BP, which leases the well, launched a "top kill" process Wednesday (May 26) in an effort to cap the well and stop the leak. In an announcement Thursday (May 27), USGS director Marcia McNutt said the National Incident Command's Flow Rate Technical Group was asked last week to develop an independent, preliminary estimate of the amount of oil flowing from BP's leaking oil well. That group's analysis determined that the overall best initial estimate for the lower levels, or boundaries, of flow rates of oil is in the range of 12,000-19,000 barrels per day, the USGS reports. According to the USGS, "the team used three separate methodologies to calculate their initial estimate, which they deemed the most scientifically sound approach, because measurement of the flow of oil is extremely challenging, given the environment, unique nature of the flow, limited visibility and lack of human access to BP's leaking oil well." One team looked at oil on the surface and came up with the estimate of 12,000-19,000 barrels per day. A second team that included Wereley used a different method and came up with a range of 12,000-25,000 barrels per day, the USGS reported. The official government estimate uses the overlapping range of both estimates. Wereley said the consensus of his Plume Modeling Team is that the leakage at the time of the viewed video clips averaged at least 12,000-25,000 barrels of oil per day, plus considerable natural gas. That figure, he said, could possibly be significantly larger if the conservative assumptions used to make the estimate were relaxed. When an initial 30-second video clip of the oil gushing from the 21.5-inch pipe was released by BP on May 12, Wereley deployed a technique called particle image velocimetry (PIV) to create freeze-frame shots of the video. From there, he ran a computer analysis to estimate the number of pixels based on the pipe's size. 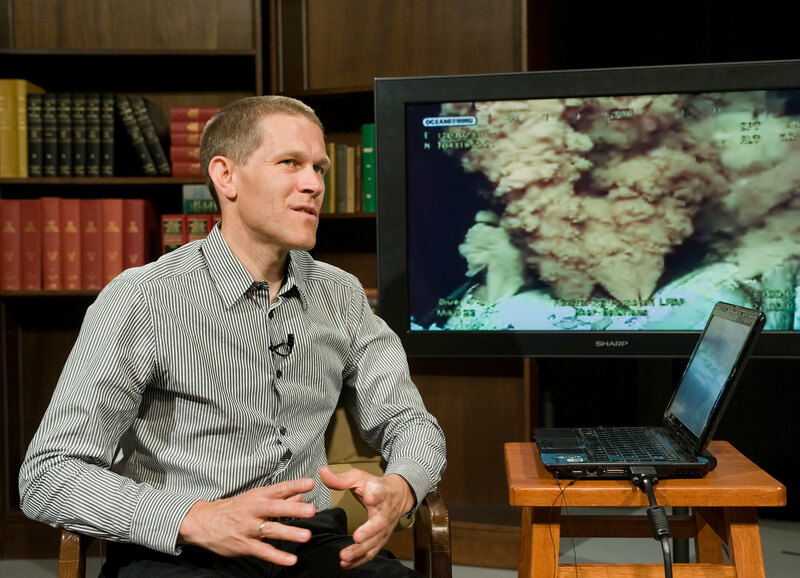 Wereley, who has co-written a textbook on particle image velocimetry, created a conversion from pixels to inches to compute how fast oil was flowing from the pipe. Using the area of the pipe and the speed of the oil, he concluded that two feet of oil was leaking per second. From that calculation, Wereley determined that 56,000-84,000 barrels of oil, plus gas, had been leaking daily into the Gulf - a flow that was nearly 10 times higher than other estimates at that time. Wereley said that accounting for decrease in oil volume due to the gas coming out of solution, the flow rates released by the panel of experts Thursday (May 27) align with those he calculated two weeks ago using the first BP video. Using a longer and clearer video clip of the oil leak for the USGS analysis, Wereley said the figure from his team was reduced to the 12,000-25,000 per-barrel range because of the amount of methane gas and other natural gases consistently gushing out of the pipe. "The initial video that was released by BP was compressed, brief and not of the highest quality," said Wereley, who testified on his initial findings before Congress on May 19. "However, additional video and other important facts were released to the federal interagency Flow Rate Technical Group that allowed a more accurate determination of the oil flow."